Buying new plants for your garden is one of life’s little pleasures and can be extremely satisfying but often expensive. Equally as satisfying and an awfully lot cheaper is propagating your own plants. There are several methods available; softwood cuttings, semi-ripe cuttings, hardwood cuttings, root cuttings, leaf cuttings, division, layering and collecting and sowing seed. These cuttings are taken from the current years young growth between April and June. Keep the compost moist and once you begin to see new growth, pot individually into 10cm pots. Before planting out in the garden get them used to cooler temperatures by placing them outside during the day or move to a cool greenhouse. These cuttings are taken from this year’s ripe growth between June and August. These cuttings are taken from this year’s woody growth between September and November. Ensure the soil is well drained and the cuttings should be rooted by the following Autumn. These cutting should be taken between September and November. Place in a cold greenhouse or cold frame and keep the compost moist. The cuttings should have rooted by the following spring when they can be potted on. There are three methods of taking leaf cuttings. Division involves dividing a plant into two or more plants and should be carried out on most perennials every 3-5 years to maintain their vigor. Layering works well on woody plants and involves growing a new plant while it is still attached to the parent plant. Roots should develop within 18 months at which point it can be removed from the parent plant and planted in its own spot. There are several advantages and disadvantage to propagating by seed. Most people will buy their seeds from a garden centre or specialist seeds man and just follow the directions on the packet. However it is very easy to collect seed from your own garden and also completely free. Some plants will seed themselves, usually where you don’t want them. Once they have seeded just thin them out and/or transplant to another part of your garden. You could also pot them on and give them to friends and family. If you do use your own seed you must remember that most do not come true to type so will not necessarily resemble the plant they came from. You must collect the seed when it is ripe; store pods in a warm, dry place until they split. Once you have the seed label them and keep in a dry, dark, well ventilated area at between 1 and 5 degrees C.
Hardy Annuals can be sown outside in March or April when the soil has started to warm up. Biennials and Perennials can be sown later in May or June. 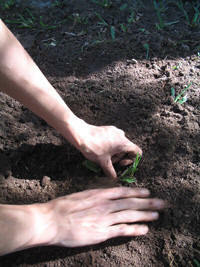 Sow directly where you want them to flower/fruit or sow in seedbeds and transplant later. When the seedlings appear thin them out to around 10cm apart, carry out a final thinning to 15-20cm depending on the size of the final plant. Other seeds can be sown in a greenhouse, a propagator or on a window sill. Never handle seedlings by their stems. If the seeds are to go outside they need should be first moved to a closed cold frame to get them used to the change in temperature. After a few days they can be left in an open cold frame or stood outside during the day. They can be planted out into well prepared ground once all risk of frost has passed. Hi Linda, it was quite helpful but I’m a beginner (v,v,new) and am just keeping house plants until I get a bit (alot,????) better. Putting a couple in the garden today. What I actually wanted to know was how to, if possible, propagate from Cacti?? Well I shall have a good look at this site and learn ???? Fingers crossed ???? If anyone knows if you can propagate Cacti? If so please explain in easy steps as I am very new ??? ?